The historical unveiling of Emmeline Pankhurst’s statue will be the first of a woman in Manchester since Queen Victoria was unveiled in 1901. The unveiling takes place on the 14 December, exactly one hundred years since the first women voted in a General Election. People’s History Museum, the national museum of democracy. Marchers will converge on St Peter’s Square, welcomed by the uplifting voices of the Manchester Community Choir, where the main proceedings will begin at 12 noon. 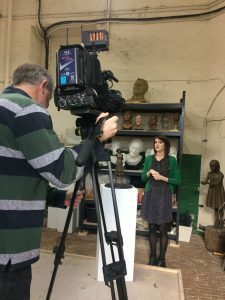 Huckleberry Films and the BBC and Press Association joined us at Bronze Age Sculpture Casting Foundry (Limehouse, London) on the 25 October to film the alchemy of the Our Emmeline bronze pour (see below). Thanks to Nigel Kingston for the photos, taken Monday 20th August 2018. 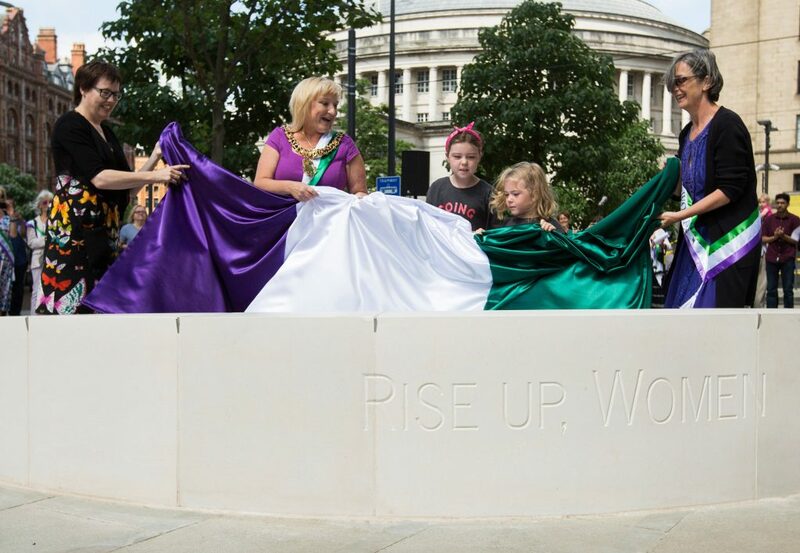 We hit the national news with the unveiling of the stone Pankhurst Meeting Circle to celebrate Emmeline’s 160th birthday, which I designed to later encircle the bronze Emmeline (being unveiled 14 December 2018). Our new generation of Emmelines – Penny and Sadie – join the Lord Mayor Councillor June Hitchen, Helen Pankhurst (Great Grandaughter of Emmeline) and me in doing the grand reveal. (Photo: © Bernadette Delaney Photography). 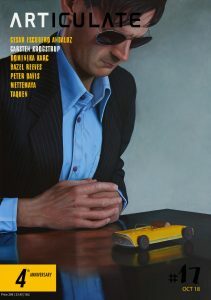 Thanks to artist Sandra Reeves for the work on the lettering design and layout. And to the skilled team from Tilleys Stonemasons that has been working incredibly hard in the heat of St Peter’s Square to install the Meeting Circle. Here is the feature by Huckleberry Films. Excellent documentary by Helen Tither, presented by Sally Lindsay, that I was honoured to be part of. Showing 8 June, 7.30pm on BBC One North West and on BBC4, 18 June 7.30pm. Also available on BBC iPlayer. 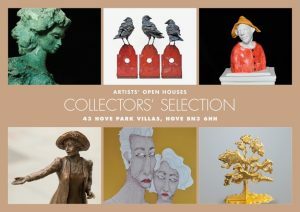 Come and see Emmeline at the Collectors’ Selection Open House during the Brighton May Festival 2018 (all weekends, including Bank Holiday Mondays). 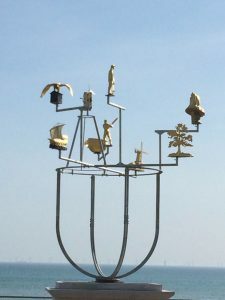 This year focuses on innovative 3-D work, with all profit going towards the next exciting stage of the Hove Plinth project. 11-6pm, 43 Hove Park Villas, Hove BN3 6HH. 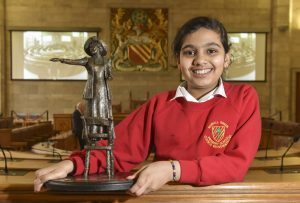 Author Hunter Davies tells the story of the Cracker Packers and their statue, soon to be unveiled, in ‘Biscuit heroines, I give you a cracker of a statue‘ (p12). Here we are last summer with my well-thumbed copy of the Biscuit Girls. On Tuesday the 13 February I chose my favourite woman composer as part of the “30 on 30” initiative on BBC Radio 3 Breakfast, as part of the centenary of the first women gaining the vote. 30 people are speaking for one minute about their choice, on the 30 days between the centenary (6 February) and International Women’s Day (8 March). I chose Jocelyn Pook’s ‘Dionysus’, and the day before, Helen Pankhurst chose Ethel Smyth’s ‘March of the Women’. For the centenary, on 6 February, Theresa May makes a surprise visit to the Pankhurst Centre, the home of the Pankhursts, in Manchester. 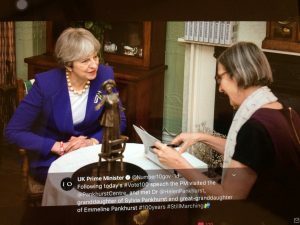 Helen Pankhurst signs her new book – Deeds not Words – while Emmeline urges Theresa May to rise up and fight for women’s rights! Today, 6 February, I’m in Manchester, joining the celebrations of the centenary of some women gaining the vote. 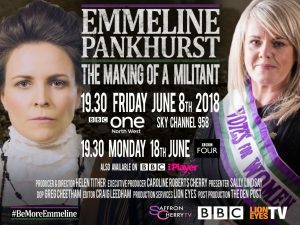 My day will start with filming for the BBC’s ‘Emmeline Pankhurst: making of a militant’, inside the former Free Trade Hall, a significant site for the Suffragettes. And my day will end at the Pankhurst Centre, with the launch of ‘Deeds not Words: the story of women’s rights then and now’, the new book by Emmeline’s Great Granddaughter, Helen Pankhurst. evening news (18 January 2018). 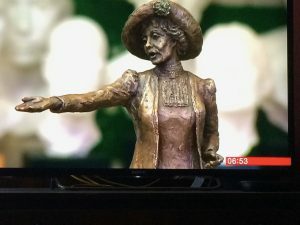 BBC Breakfast feature on three forthcoming statues – of Emmeline Pankhurst, Alice Hawkins and Millicent Fawcett – on 2 February 2018. 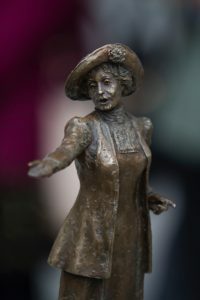 I’m incredibly excited that today the Government has recognised the legacy of Emmeline Pankhurst and Manchester in gaining women’s suffrage, by giving a major grant (£370,000) to the city to support the Emmeline Pankhurst Statue and the Pankhurst Centre. This is part of the Centenary Cities: 100 years of votes for women initiative, recognising 100 years since the first cohort of women gained the vote. Full press release here. 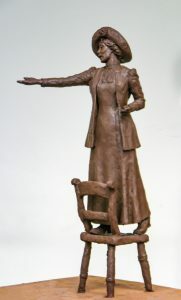 The winning bronze maquette of Emmeline Pankhurst, “Rise up, women”, can be seen this week at the Society of Women Artists’ exhibition at the Mall Galleries, SW1. 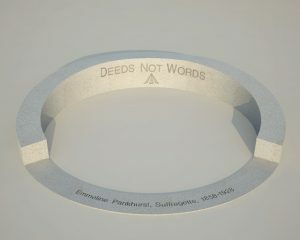 Private View Wednesday (5 July) from 10-5pm. Click here for further details. Delighted to have won this prestigious commission, which was announced in St Peter’s Square, Manchester, Tuesday 4 April. 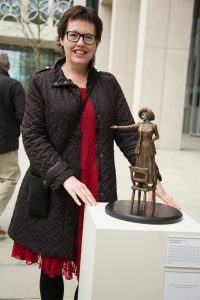 There is now a limited bronze edition of my maquette “Rise up, women” (email me for further information) (4 April 2017). 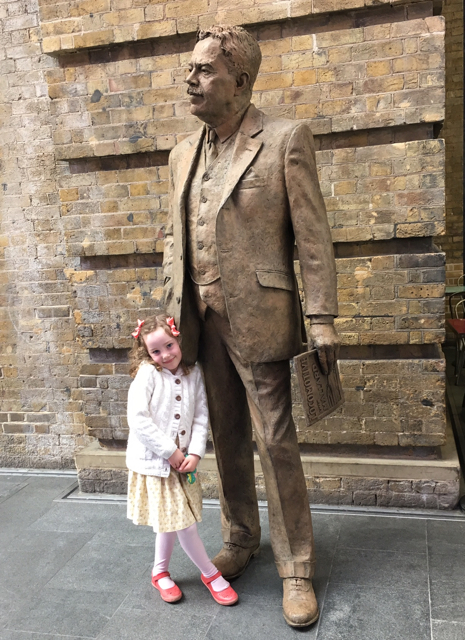 Honoured to be interviewed about my Sir Nigel Gresley statue by Joanna Barnes, for the PMSA’s wonderful magazine, 3rd Dimension. The full article here. 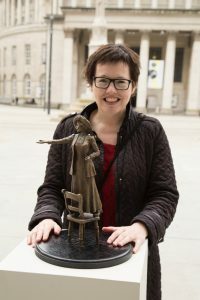 What better way to celebrate International Women’s Day than with the announcement of a statue commission celebrating women biscuit factory workers – the ‘Cracker Packers’ – to be sculpted by a woman artist! 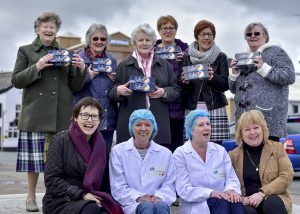 I had great fun today meeting past and current Cracker Packers at the McVities factory (formerly Carr’s) in Carlisle, where we shared a cuppa and biccies. We then convened at the nearby site where the bronzes of the two Cracker Packers, one from past times and one from today, will be unveiled next International Women’s Day, 2018. You can see that we had a hoot. For the full details see the press release. Photo by Stuart Walker. Now it’s time to vote for your favourite maquette. 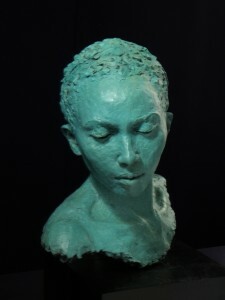 You can also buy your very own bronze “Rise up, women” from an edition of 12 (email me). 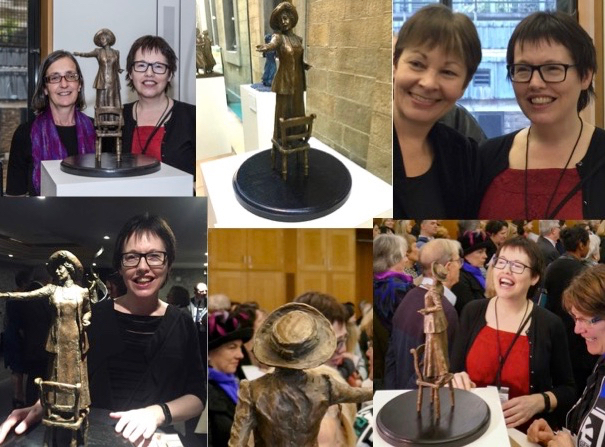 On Monday the 27th February 2017, my maquette – “Rise up, women” – was unveiled along with the other five shortlisted Emmeline Pankhurst maquettes. It was a lively, packed room at the Houses of Parliament. The feedback was tremendous. Helen Pankhurst, Emmeline’s great-grandaughter, joined us along with many Members of Parliament and Peers, including Baroness Campbell of Surbiton. 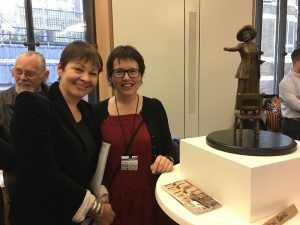 As my MP, Caroline Lucas came especially to view my maquette. We also had exciting unveiling events in Manchester – at HOME, the Council Chambers, and Manchester Town Hall. Follow here the process from the initial idea to my final bronze, “Rise up, women”. To the left is the final clay. 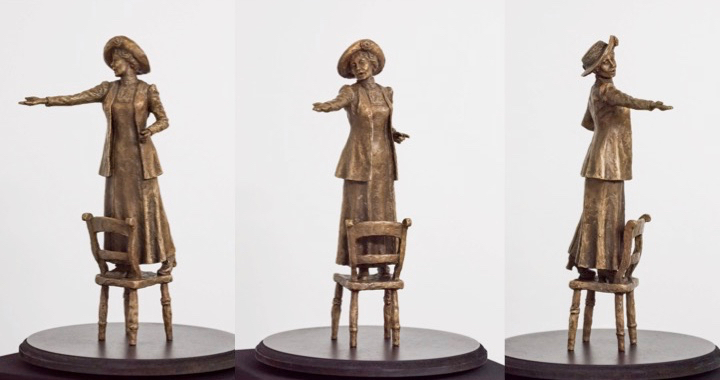 On Monday the 27th February 2017 the six shortlisted Emmeline Pankhurst statue maquettes will be unveiled. 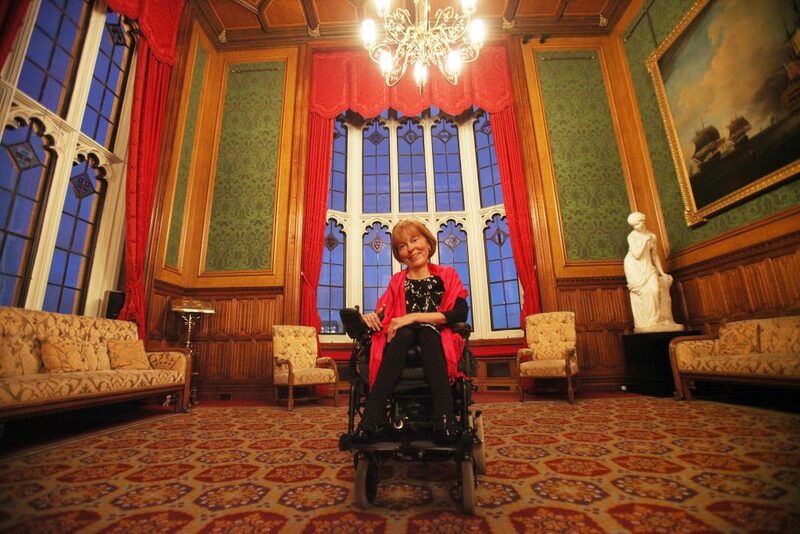 Helen Pankhurst, Emmeline’s great-grandaughter, will be joining us at Portcullis House. Sorry – this event is now full. 2017 started well, with me being shortlisted to celebrate the lives of the women workers – the “Cracker Packers” – at the Carr’s (and now McVities) factory in Caldewgate, Carlisle. 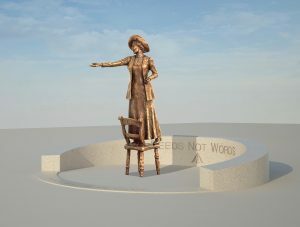 I am really excited to make it into the final 6 shortlist for the Emmeline Pankhurst Statue commission for St Peter’s Square, Manchester. Emmeline Pankhurst was an inspiring leader of the Suffragette movement, born in Moss Side in 1858. I am now working on a maquette (or model), which will be cast in bronze and unveiled at the Houses of Parliament before going on show in Manchester in Spring 2017. With my background in promoting women’s rights and gender equality, you can imagine how exciting this project is for me. Labour Councillor Andrew Simcock is spearheading the project – see the full press release here. 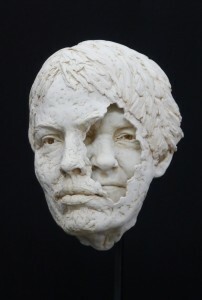 ‘Mum/me’ features in this joint exhibition between Dorchester Arts and The Art Academy, featuring 2D and 3D work from some of the finest portrait sculptors and painters in the UK today. The exhibition showcases ‘portraiture’ in its broadest sense, from traditional portraits to works that push the boundaries of the term ‘portrait’. Opening times are: Monday to Friday 9am – 5pm, 29 Oct 11am – 2pm. I had the honour of delivering the opening speech for this unusual yet inspiring exhibition. How often do you see the 2D work of 3D artists shown alongside each other? There is a myth that sculptors can’t work in 2D, which is quashed by this exhibition, and the writings and work of Rodin, Matisse and Moore. The show ended on the Monday with me giving a talk on my Sir Nigel Gresley statue to 55 GCSE Art pupils from a local school, followed by a tour of the exhibition and a drawing competition, which produced some excellent work. This year’s exhibition was a stunner. If you don’t believe me, read top blogger Katherine Tyrell’s review. 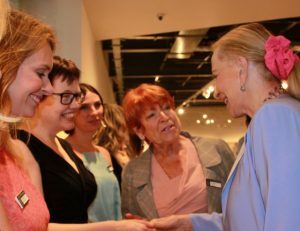 The renowned portrait painter Daphne Todd OBE gave a stirring speech and the awards were presented by the SWA Patron HRH Princess Michael of Kent, seen here greeting Hazel and other members of the SWA Council. The Unseen Steam team were there to capture the unveiling of my 7ft 4in Sir Nigel Gresley Statue at King’s Cross station on the 5 April 2016. Sir Peter Hendy, Chairman of Network Rail, removed the veil in front of a large crowd. Sir Nigel’s grandson Tim Godfrey spoke as did I, before everyone was invited to Platform 8 to inspect the Gresley N2 steam engine. 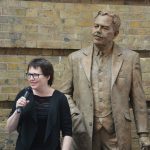 Below is a lovely photo of Bessie cosying up to Sir Nigel after the unveiling.